February is cold. It's cold and dark and damp. It makes me want to curl up into a ball, buy out Chicago's entire stock of electric blankets, hold my hands over pots of boiling water on my stove, and do many other things that are neither normal nor conducive to getting through my to-do list. But it's okay. There's a light at the end of the tunnel. Nope, not March. March is cold too. No, I'm talking about something toasty and delicious. Something that will get you through these cold months by warming you through and through. That's right, I'm talking about soup! Starting on February 1st, Thin Crust Deep Dish is launching its first ever Scrumptious, Sumptuous Soup Week. Each day we will be brining you one heck of a soup recipe. Now here's the best part: Kylie and I aren't doing this alone! 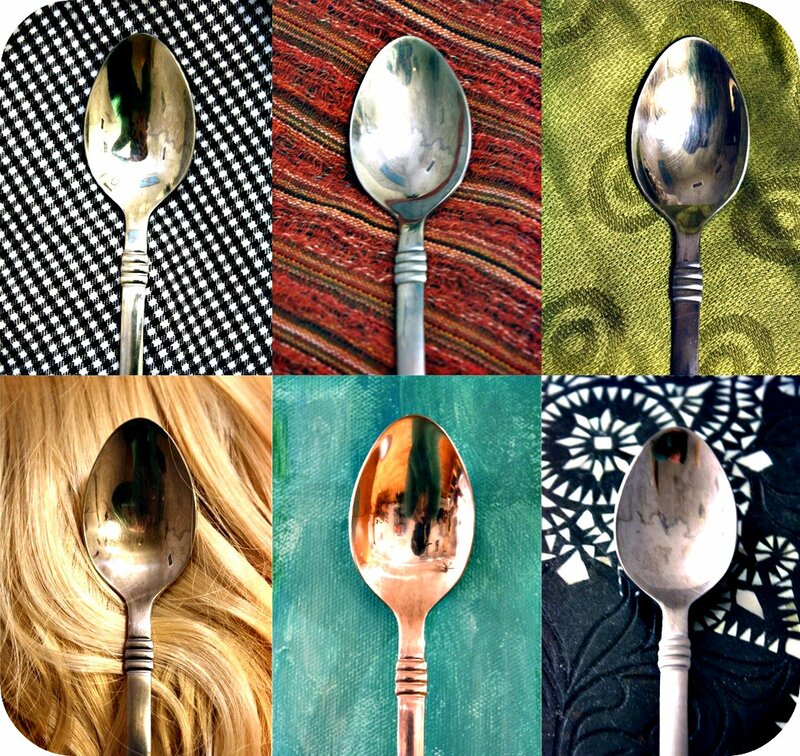 We're going to introduce you to several mystery guest cooks who have kindly agreed to share their own favorite soup recipes. So crank up that burner, grab your ladle, and let's go soup-crazy. I'm not going to lie. I made these pecan tassies at the beginning of December. I got my mom to e-mail me her recipe, and I tweaked it with my whole wheat pastry flour and honey instead of all-purpose and sugar. 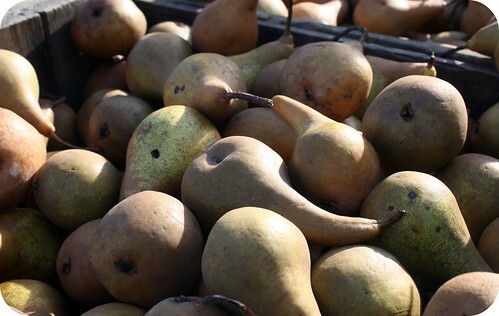 I photographed them, straight out of the oven, against the piney backdrop of our table wreath and wintertime plates. And I'm posting all of this now, in mid-January. Somehow that post on how much I love pecan tassies and how thoroughly self-satisfied I was when I made them sugar- and white flour-free didn't get written in December. Now it's January, and not only are pecan tassies not the treat you want to be making in January, but the photographs here are all red and green and probably made you do a double-take when you first saw them. No, it's not December anymore. And I also don't care. Since going sugar-free, these pecan tassies have been my greatest baking achievement. I decided I couldn't live without them this holiday season, and converted them, and I can honestly say that I like my sugarless version better than the original. The tender flake of the cream cheese dough is still there, just with a little more tooth thanks to the whole wheat flour. 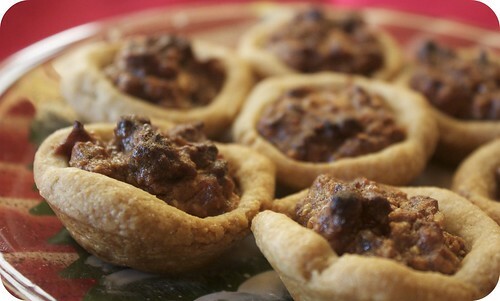 The honey also showcases the creamy sweetness of the dates, which are what make these mini-pies special, in my opinion. I'm justifying the fact that I'm posting this unabashedly holiday-themed recipe here with the fact that I'll probably make these throughout the year, they're so good. Plus, after the really nasty flu I was home with for three whole days this week, I'm really needing something to take the edge off of January, even if that something is a month-overdue Christmas cookie. In other news, today is the last day of our week of Sugar Freedom, which included a lot less posting than we had intended due to both Adriana and I getting sick at once. Sorry about that. We're still excited to hear your sugar-free experiences, though, so feel free to share. In a large bowl, combine the 1 cup butter, cream cheese, and flour. Mix until well-blended. Divide the dough into 4 equal parts, then separate each part into 12 balls, all the same size. 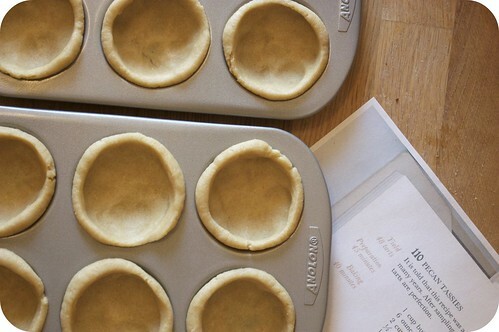 Place the balls in the 2-inch sections of 4 ungreased, miniature muffin tins. 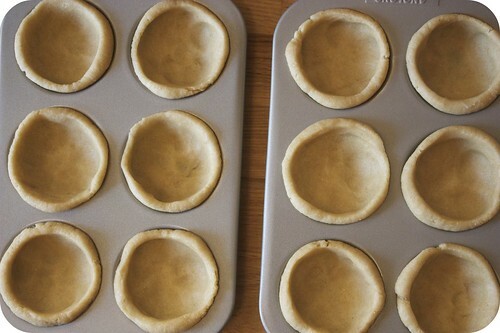 Using your thumb and forefinger, press each ball into its cup, working the dough evenly up the sides to the rim. Cream the remaining 1/2 cup butter with the honey. Add the rest of the ingredients and mix well. Divide among the unbaked shells. The shells may not look full enough, but the filling will increase in volume when baked. Bake until golden brown, about 30 minutes. Cool on racks before removing the tarts from their tins. These will keep several days at room temperature, though you can also freeze and defrost before serving. If you've been planning to have a passionate love affair with vegetables to get you through this winter, right now is a great time to begin the seduction. Being a vegetable lover is kind of like being Bella Swan. Everybody else snubs the vegetables (read: the vamps), but you're drawn to them, especially that one that's likeohmygod so pretty and sparkly. (Fine, my metaphor has holes. I don't know of any vegetables that actually sparkle in the sunlight.) You don't know what it is, but those vegetables make you feel funny. They make you feel good. You decide you can't possibly bear another day without them. In fact, you'll go into a deep depression if they leave you. So, yeah, you decide that vegetables are the center of your universe and you'll orbit around them for the rest of your days. Plus, now that you've declared your love for veggies, you're totally going to live for, like, ever. And you convert all your friends and family to your vegetable-loving ways. The end. Anyway, sorry, I got a little carried away there with my love for, ahem, vegetables. My point is this: they're good. I don't know why people are always snubbing them. Probably because folks don't know how to cook them. They don't know the miraculous sweetness brought out in roasted cauliflower, or the delicate crunch of a broccoli stalk. 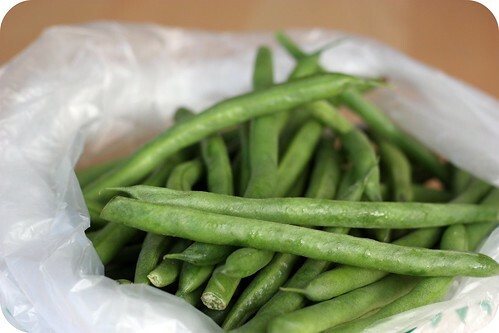 Today is a great day to get to know the sweetness of vegetables. Here are some of our favorite vegetable recipes, as well as some we've been meaning to try for quite a while. Even if vegetables don't sparkle in the sunshine, they can be pretty darned gorgeous. How's the week of Sugar Freedom going for you so far? Thoughts? Comments? And what's your favorite way to sink your pointy teeth into veggies? *For more tongue-in-cheek Twilight fun, see Yes, I Read It. It's Still Stupid. It's made me LOL more times than I can count. This is the first day of Thin Crust Deep Dish's week of Sugar Freedom. It's an event that you can join, and we hope you will. We'll be posting our experiences and support here throughout the week, so check back daily to share how it's going for you so far. Lots of people preparing to begin a week of Sugar Freedom would purge their cabinets of candies and sweets left over from the holidays, padlock the freezer containing their partner's favorite rich ice cream, and stock up on tasteless wheat crackers. I dare you to make this week of Sugar Freedom different. It's assumed that we're hooked on all the things that are bad for us, that without a nebulous quality called "self control", we would all snack endlessly on chocolate wafers and sugar-infused commercial chips. Are you sure that's true? Does salsa really taste better when it has sugar in it? I'd have to say no. For me, sugar freedom isn't about deprivation. It's about finding the foods that are delicious, fresh and good for you. When you first start to think about going sugar-free, you might want to throw out your packaged cereals if they contain sugar and white flour. You might also leave them there, as I did. I wanted to maintain what I knew of myself: that I am in control of what I eat, and I'm certainly not going to force my friends and family to conform to my changed eating habits. Whatever your method for approaching your week of sugar freedom, here are some tools to prepare you for this week. 1. Fermented Things: They'll be your best friend while you're transitioning to Sugar Freedom. It increases the amount of beneficial bacteria in your gut, helping you to absorb the nutrients from the food you eat and therefore reducing sugar cravings, which are often just nutrient cravings in disguise. Sauerkraut is my favorite, and I eat it every day. You can make it yourself, or you can buy Bubbies brand. If you buy it, make sure you get it in the refrigerator section of the store. 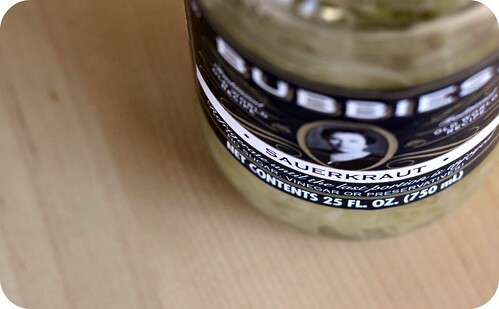 The unrefrigerated jars sitting on the shelves have been canned, killing the beneficial bacteria which is the whole point of sauerkraut anyway. You can also buy or make kimchi, which is similar to sauerkraut. You can add sauerkraut or kimchi to your diet by eating it as a side dish to your meals. I usually just snack on a small bowl on its own before dinner. Other fermented things that will help out are miso (just make sure to add the miso after the water has stopped boiling; otherwise the boiling kills the beneficial bacteria) and kefir (I really love Nancy's brand). There are so many things you can ferment, and these just scratch the surface. If you want to find out more about fermented foods and beverages, check out Sandor Ellix Katz and his book, Wild Fermentation. Good Earth Sweet & Spicy Herbal Tea: This is the beverage that makes my work day every day. 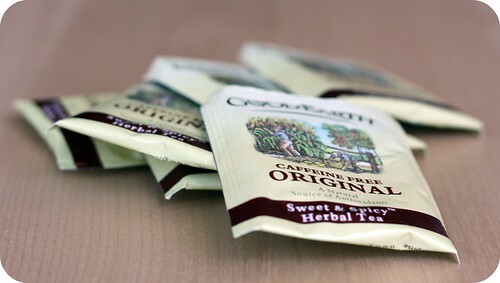 It's a completely caffeine-free herbal tea that tastes incredibly sweet but contains no sugar. I've gotten several of my friends hooked on it for good reason. It's especially great if you have a late-night sugar craving but don't want to eat right before sleeping. Dried Fruits and Nuts: Raw cashews and almonds, dried figs, puckery raisins. Dried fruit is one of those simple pleasures. It's especially great if you eat it alongside some nuts or other fats like a great cheese to reduce the impact of the natural sugars. Dates: Yes, I know what you're thinking. Dates are fruits, Kylie. Gosh. But if most dried fruits are simple pleasures, then dates are lavish. I eat them on their own as special treats, but you can also use them in place of sweeteners in some recipes, such as homemade fruit and nut balls. Larabars: They come out of a package, and they're rather expensive, but they're just so good that I can't help but add them here. Larabars are delicious snack bars, each one made with a combination of nuts and fruit and generally only containing three ingredients. I'm pretty obsessed with the Key Lime Pie flavor. 3. Delicious, Healthy Fats While you've stopped eating sugar, that doesn't mean that your food life should stop being rich and deeply rewarding. Eating satisfying fats is a huge part of making the transition to sugar freedom possible. Any chef can tell you that fats make things yummy. And they satiate you. Some of my favorites are cultured butter (which you can make or buy), ghee, olive oil, and lard. There are also great artisanal cheeses which I could go on about for pages. Lately I've been particularly impressed with artisanal American cheeses, which I find to be way under-appreciated. I'm deeply passionate about most everything from Cowgirl Creamery, especially their Purple Haze, and Nancy's Hudson Valley Camembert. 4. Practice, Not Perfect: One of my favorite things that yoga teachers tell us in class is this: "It's called yoga practice, not yoga perfect." The whole point of yoga isn't doing the poses perfectly, but the act of trying. I think this is a beautiful way to approach not just yoga, but also life. It applies to sugar freedom, too. This isn't about never eating sugar again, or even about staying completely sugar-free throughout this week. This is about trying, experimenting and seeing how you feel and what comes up for you when sugar goes away. It's an exercise in life rather than a restrictive rule. So remember that this week: This is sugar freedom practice, not sugar freedom perfect. How are you preparing for the rest of your week of Sugar Freedom? How's the first day going for you? Please share your tips and questions here. And if you're not yet on the list of participants, just leave a comment. We'll happily add you. I'm going to invite you to join Adriana and me on a journey next week. I don't want you to be scared, because this isn't meant to be scary. It might feel like a step outside the mundane, outside what you know, and that might feel uncomfortable. But I'll be here with you, and Adriana will be here, and other people will be here, too, feeling our way along the path and discovering things together. After a few faltering steps, after tripping on snags in the earth and climbing steadily up a few boulders, you'll realize that you're actually having some fun. That's my prediction, anyway. Now. Are you ready to hear what I'm proposing? I'm inviting you to join Adriana, me, and some other Thin Crust Deep Dish friends as we embark on a week of Sugar Freedom. This is an experiment. It's an opportunity to explore new sweeteners, to step away from the mainstream and into a world of thrilling flavors that you might have forgotten about or have yet to encounter. It's also a chance to break free of a dependence on sugar. Officially, the week of Sugar Freedom will run from January 11th to January 18th. Adriana and I will be blogging each day about our sugar-free experiences, and anyone who would like to contribute may do so. If you would like to participate, please leave a comment here, and I'll add your name (and blog, if applicable) to our running list. You can also follow along and share your experiences on Twitter using the hashtag #sugarfreedom. Our week of Sugar Freedom will be loosely based on Kimi of The Nourishing Gourmet's Sugar-Free Challenge, the event that spurred me to step back from sugar three months ago. Based on Kimi's challenge, we will have three different levels at which to participate. Beginner: This is the level that I have been implementing loosely since October. While it's called "beginner", it has changed my life immensely, in terms of eating and many other aspects, too. Those who participate at this level will cut out refined sugar, corn syrup and white flours. You can experiment with more natural sugars, including honey, stevia, date sugar, molasses, coconut sugar and agave nectar. Moderate: Here you will also remove those natural sugars. 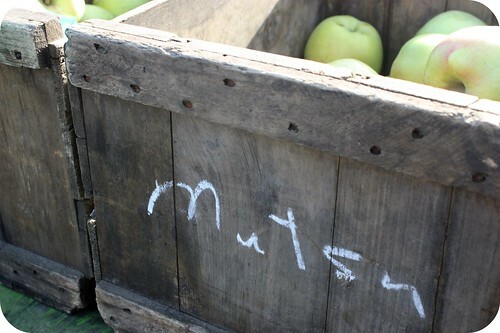 The sweetness in your food will come from the fruit you eat. You might also think about removing other starchy foods like potatoes and rice that can lead to sugar cravings or encourage yeast growth if you have yeast issues. Advanced: Remove all sugar-forming foods, including most grains, starchy root vegetables, and fruits. Kimi tells us that buckwheat, millet and quinoa are still acceptable at this level. Please note that this level is intended mostly for those dealing with candida. I'd recommend caution with this level if you have any health issues or a history of eating disorders. Restrictive eating is not at all what we're aiming for with this challenge. We're looking for the fun and adventure! We hope you'll join us on this week-long journey. If you have any questions about the challenge, feel free to ask them in the comments section, and I'll answer them as best I can. We can't wait to start this journey of Sugar Freedom and hope you'll join us along the way.